One of the best things about having long hair is being able to sweep it off your face and into a bun or ponytail anytime you want! Even though long, flowing locks of hair seems like it would be super low maintenance, it’s actually even more important to take really good care of it .This is because the longer your hair is - the older and drier the ends of your hair are - which means it needs some TLC to keep it looking shiny and healthy! Summertime means you should protect your skin with sunscreen but many of us don’t realize that your hair can also get damaged by the sun’s rays and also needs to be protected! Your hair can get a sunburn too! And if you color your long hair - the sun can also do a number on fading. And don’t forget to protect your hair from salt water and chlorine from swimming in the pool or beach! Check out our top ten tips for taking care of your long hair and a simple recipe for a homemade avocado hair mask! Make sure you are washing your hair with the right shampoo and conditioner[/kwlink] If you’re using an oily hair shampoo and you have fine hair - your hair will feel lifeless and flat. If you have color-treated hair- using the right shampoo will help the color last longer. Rinse your hair with cool or lukewarm water. Rinsing it with hot water can cause hair damage to the cuticle. When you come out of the shower and need to dry wet hair - don’t rub it in a towel. Use the towel to lightly dab and wring the moisture out of your hair. Don’t let it dry in a towel turban - this causes hair breakage over time. 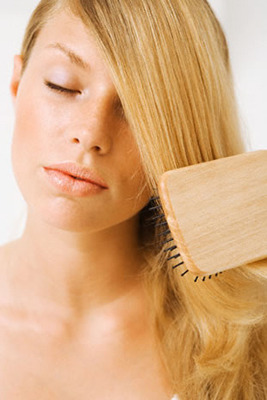 Brush your hair with a natural bristle hair brush (try and avoid plastic brushes). Detangle wet hair gently with a wide tooth comb and some detangling spray. Be gentle with wet hair, it can stretch more when wet and is more prone to breakage. Clean your brushes regularly by soaking them in warm water and shampoo for 5 minutes and removing stray hairs. Avoid using the hairdryer and heat styling tools everyday. This dries out your hair and takes the shine away if you do it too often. Even better if you try and let your hair air dry whenever you can! Use snag-free hair elastics on your hair to prevent breakage. After swimming in the pool or at the beach wash your hair with a mild-cleansing shampoo to remove saltwater, chrlorine and pollutants. Protect your hair from UV damage by using a protective conditioner with sunscreen in it when you go out in the sun. 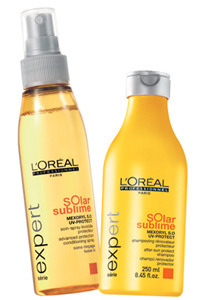 It not only protects your hair from sun damage but also keeps color-treated hair fresh. Don’t neglect your scalp, it can also get sunburnt and dry - lightly spray in leave-conditioner to moisturize all day and rub some pure jojoba oil on your scalp if it feels itchy. You can also put the jojoba oil on your ends - it’s a light oil that mimics the natural oils of your hair so it won’t feel heavy at all! 1Deep condition your hair with a moisturizing hair masque once a week. If you have thin or fine hair, don’t apply conditioner on the scalp to avoid having it go flat. This is a quick and easy moisturizing hair masque[/kwlink] that you can whip up in a few minutes! There are no rules, just do it whenever your hair feels like it needs a moisture boost! You’ll need ripe avocados, olive oil and a bowl! Mash up the ripe avocados in a bowl. How many just depends on how long and thick your hair is. Around 2 regular sized avocados is most likely enough. 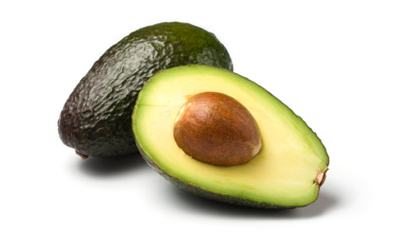 For every avocado that you use, add 2-3 tablespoons of olive oil. Apply to dry hair and leave it on for 20-30 minutes and rinse out with some gentle shampoo. This is a great recipe for shiny hair!